Customer kindly contacted us to review storage conditions stated on the datasheet for this product. I have been able to confirm that this product is provided in 40% glycerol. For longer term storage we recommend bringing the total glycerol content up to 50% and stroage at -20C. In order to do this, please at 5ul of glycerol to the vial and mix. We have received the mentioned antibody today. I have a question regarding short term storage. The person who will use this antibody is not here today and cannot prepare it with glycerol. What is most proper, put in refrigerator or freezer until Monday? Please put the antibody in refrigerator at 4C over the weekend. Cusotmer kindly contacted us regarding use of this product in WB. As we discussed on the phone, there are a few things which may help in this case. ASmearing would most likely be caused during the SDS-PAGE step and could be an indicator that total protein wasn't separated evenly.I would recommend running another blot with samples which have been heated at 70C for at least 10 minutes and using all new running and transfer buffers. As this product was purchased one year ago, it may be that the antibody is losing some efficiency we recommend avoiding any freeze thaw cycles if possible. El anticuerpo que pedí ayer efectivamente ha llegado hoy al laboratorio, asombrosamente rápido! Sin embargo debo comunicar que tras centrifugar el anticuerpo, para guardarlo en alícuotas de 5 ul, hemos notado que solo habían 20 ul en el tubo, en vez de 25 ul como debía ser. Considerando lo caro del producto y que 1/5 del mismo no lo hemos recibido me pongo en contacto con Usted para solicitar solución a este fallo. Lamento mucho las molestias ocasionadas por la falta de volumen en el vial de ab15080 recibido. ¿Habéis centrifugado el vial y comprobado que el líquido no haya quedado adherido a las paredes o en el tapón del mismo? Si efectivamente habéis recibido menos volumen del indicado, os enviaré un nuevo vial de reemplazo. I would like to know the concentration of Anti-Aquaporin 1 antibody ab15080 as I couldn’t find it on your website. Thank you for your consideration. Thank you for your inquiry. 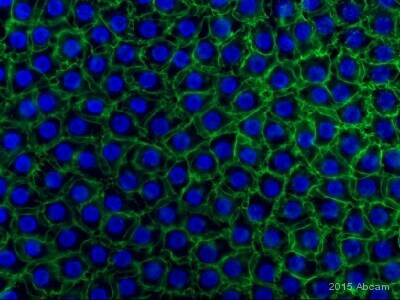 The Anti-Aquaporin 1 antibody ab15080 is provided as whole antiserum. Such unpurified antibodies will not have a concentration stated on the datasheet, as for most whole antiserum, culture supernatant or ascites fluid products the concentration has not been determined. This is because unpurified antibody preparations vary significantly their protein concentration and only a fraction of the proteins is the specific antibody. As the specific antibody concentration is unknown, you may refer to the datasheet ('Applications') or our 'concentration estimates' (attached) as a guideline for estimation. Please remember that these dilutions and concentration estimates are simply recommended as a starting point, and it may be necessary to adjust the dilution based on the experimental results. I hope this information is helpful to you. Please do not hesitate to contact us if you need any more advice or information. 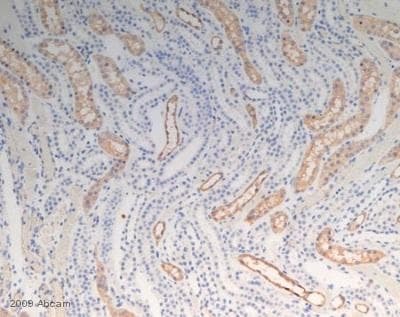 What is the immunogen seq for this antibody and what is its level of homology to pig? Thank you for contacting Abcam about ab15080. The immunogen is the C-terminal region of Aquaporin 1. The immunizing peptide is 100% homologous in Mouse, Rat, Human, and Bovine AQP1. 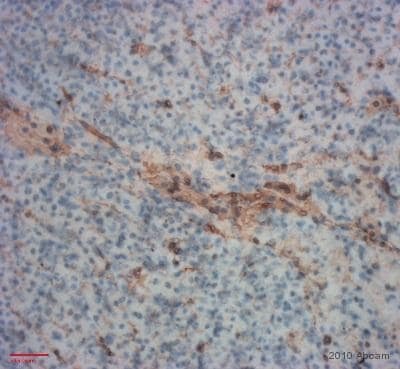 Because Bovine and Porcine AQP1 have very high homology in this region, the antibody should be able to recognize porcine samples as well. This has not been tested, but the homology is very high. If there is anything else I can help you with, please let me know.